South Africa’s short tour down under will finish with the one-off T20I on Saturday. The Carrara Oval, Queensland will host a cricket match for the first time. Primarily, this venue is used for Australian Rules Football. So, it will be interesting to see how the pitch plays for cricket. Keep reading to find out the Australia vs South Africa T20I Match Prediction. The visitors were terrific in the recently concluded ODI series. Barring the 2nd ODI in which they lost a close encounter, Faf du Plessis and his men were dominant. The Proteas won the series 2-1 and carry the momentum with them. Also, in the only T20, they start as favorites. Australians have had a poor run in international cricket across all formats. Also, the absence of key players has hurt them. However, the change of formats now brings a change of faces. It remains to be seen whether the change results in the change in fortunes or not. 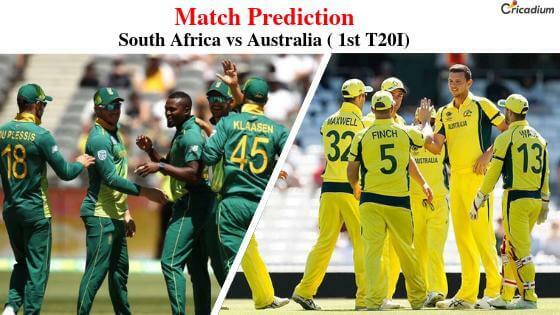 Australia vs South Africa T20I Match Prediction: South Africa has the momentum after winning the ODI series. The hosts have had a poor run in international cricket of late, hence makes the visitors the favorites.